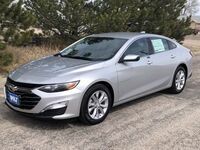 If you are looking for a sophisticated sedan that gives you great technology features to go along with the classic look of a sedan, then you just might want to check out the 2019 Chevrolet Malibu, near Omaha, NE. Despite its sophistication, the Malibu remains a very dependable vehicle. That’s why the Chevrolet Malibu is a great vehicle for those who are getting their first car, or those who are just looking for something fresh to drive. The Malibu Premier has a powerful 2.0L turbocharged ECOTEC® engine that gives you 250 horsepower, and the 9-speed automatic transmission only adds to the driving experience. Even if you decide to go with the 1.5L Turbo engine and CVT transmission on the lower trims, the Malibu still gives an exhilarating and powerful vehicle. Of course, what would the Malibu be without a suave exterior to go along with the unforgettable engine? Check out the Malibu RS and its edgy dual exhaust design that adds to the aesthetic of the Malibu. It’s only amplified by the black sport grille and 18-inch wheels. There are 6 trims for the 2019 Malibu; L, LS, RS, LT, Hybrid, and Premier. No matter what trim you decide on, the 2019 Chevrolet Malibu has the technology you’d expect in any modern vehicle, and some that you wouldn’t. From the 8-inch diagonal and reconfigurable Driver Information Center, the Malibu also has standard outboard heated rear seats to help you stay warm in cooler weather. To help keep you safe, you can get the Driver Confidence Package, which is available on the LT, Hybrid, and Premier trims, while the Driver Confidence Package II is available on the Premier. These packages include driver-assist features like the Rear Cross-Traffic Alert and Rear Park Assist, as well as the Side Blind Zone Alert with Lane Change Alert. The Driver Confidence Package II also includes the Forward Collision Alert and the Front Pedestrian Braking system. If you have any questions on the 2019 Chevrolet Malibu, please don’t hesitate to contact us here at Wolf Auto Center. We’d love to tell you more about this exciting sedan. Interested in a Chevrolet Malibu?